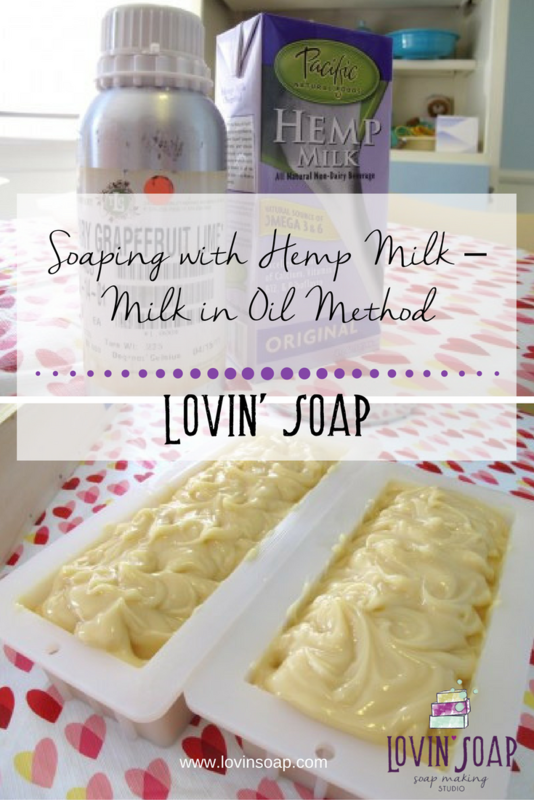 Hemp milk is a great alternative to animal milks such as goat or cow if you want your soap to be vegan. Hemp milk contains omega essential fatty acids, proteins, amino acids and many more goodies. It has a great label appeal on soap and is perfect for certain target markets. 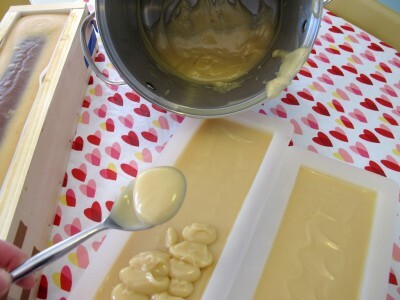 This tutorial follows the milk in oil method of milk soapmaking. 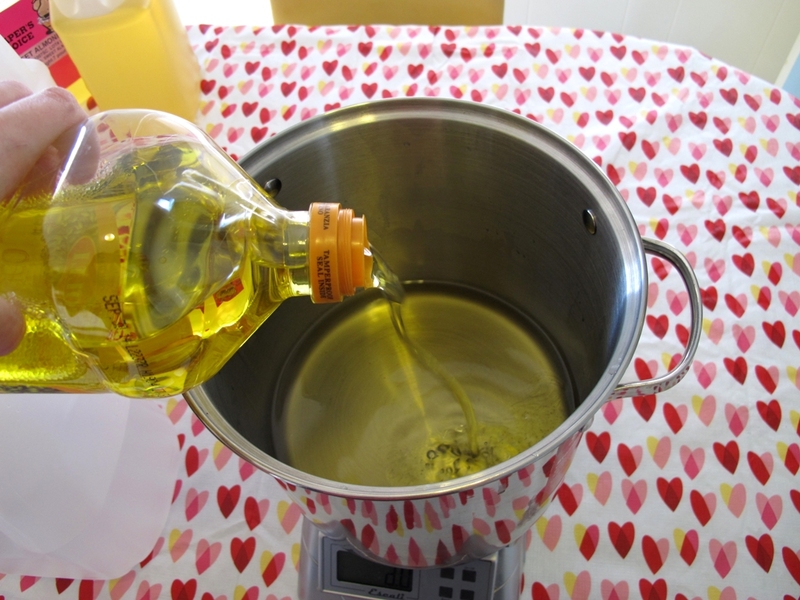 In the “Milk in Oil” method…you make a lye solution with equal parts lye and water. 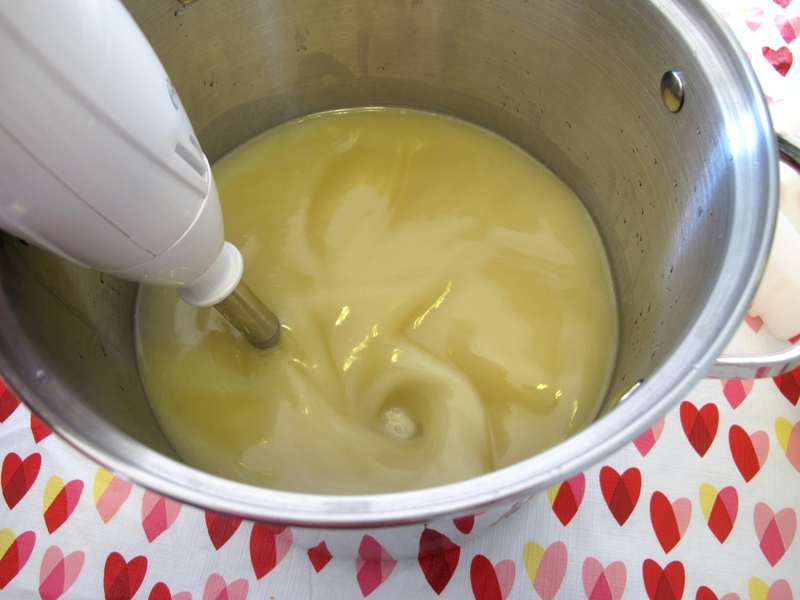 Then you add another equal part milk to the oils before you add the lye solution. This prevents the milk from burning in the lye solution. You also don’t have to go through the hassle of freezing your milk. For some people it is just easier to do. Gear up in your goggles and gloves! 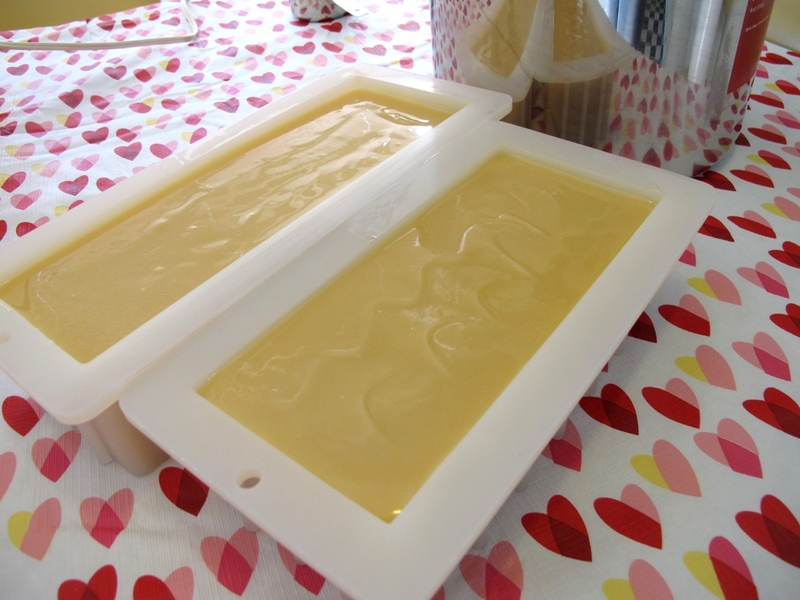 If you are new to soapmaking…visit our beginner tutorial first. The first step is to make our lye solution. I mention above to make the lye solution with equal parts of lye and water. 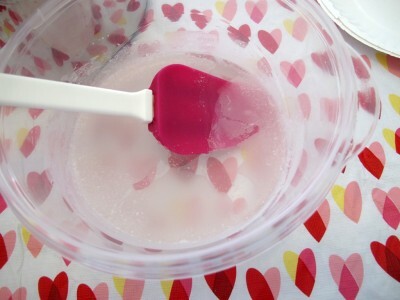 I always add a splash more because sometimes the mixture can fall out of solution if there is not enough water. Usually equal parts is the most concentrated you should go. Measure out the water and the lye. 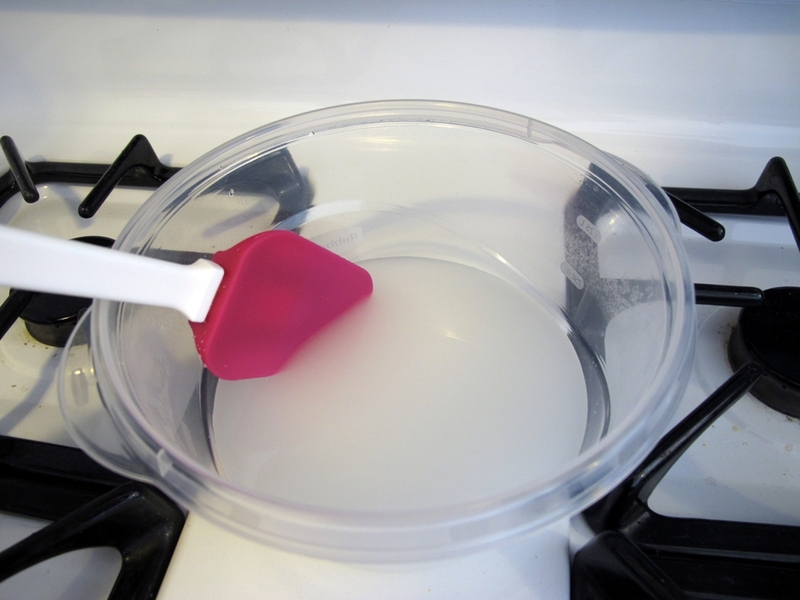 Add the lye to the water and mix in a well ventilated area. Put that to the side. Weigh out the shea and coconut oil and melt. 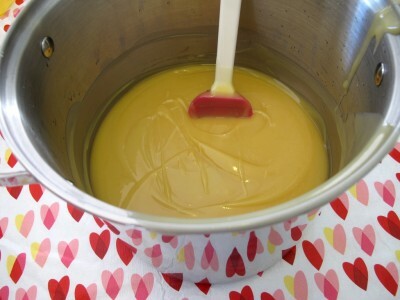 Once melted, add all of the liquid oils to the melted oils. Add 9 oz of hemp milk to the melted oils. I was able to find hemp milk at whole foods. Check out natural food stores. 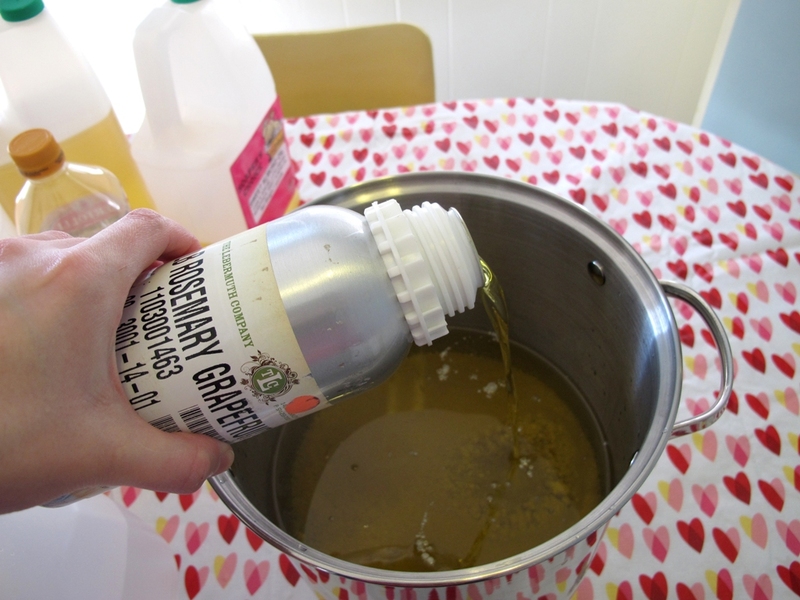 I also used a fragrance oil blend from Lebermuth – Rosemary, Grapefuit and Lime. I used 3 oz. Take a look at the lye solution. You might see some floating white filmy stuff. Give it a mix. This is just because it is such a concentrated solution and the lye is reacting to the carbon in the air and forming sodium carbonate. Lye (undissolved crust) stuck to the bottom of your container is bad…white floaties are not. Add the lye solution. Make sure you have your goggles on! Now it is time to stickblend! I wanted to do some textured tops. I filled the molds full. I let the leftover soap in the pot get thick. Then I piled it on with a spoon. Then I took a craft stick and played with it until I got texture that I liked. Let sit overnight, cut and cure for 4 weeks! Did you insulate your molds or stick them in the freezer? I made this soap with hemp milk I made from hemp hearts and an EO blend of Lavender, Cedarwood & Patchouli. It is wonderful! Sounds great! How did it turn out? 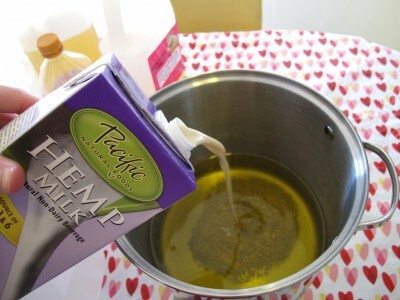 I think I will try making my own hemp milk too. The stuff they sell in the stores has a whole lot of stuff in it. will this work with any kind of milk? Hi. Awesome recipe. I don’t have avocado oil but have hazelnut. is it possible to switch it to that?? I do have avocado oil but it expired. So yeah. Also is the hemp milk discounted from the total water you used since you didn’t freeze the milk. This would be very helpful as I Wanna try making this but not too much of it. Still a beginner. You could switch it.. 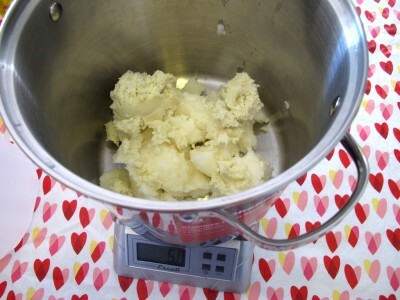 But I would recommend running your recipe through a soap recipe calculator first to check all amounts. All different oils react differently to lye so this step is a must! So if I am understanding correctly, you run the recipe through a lye calculator to get the lye amount only, ignoring the suggested water amount and take it from there? Hope This is right. I measure in grams (in UK)! Please confirm when you are able. Thank you. Any feedback from followers most welcomed. Thanks for this tutorial. 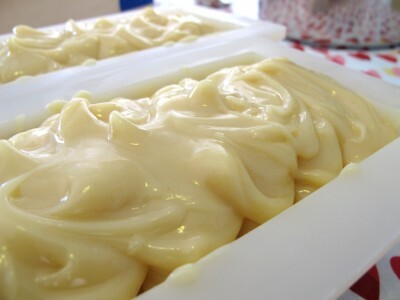 I haven’t tried making soap with milk yet, must say I was a bit intimidated. 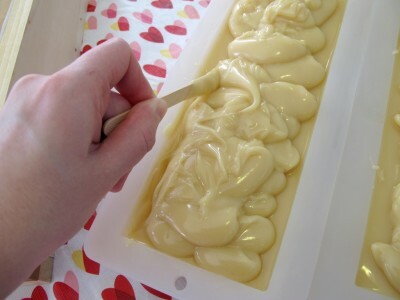 The texture of the soap looks really great that way. Never thought of using hemp milk but I will now :). I use organic coconut milk (instead of water) and it’s just lovely – creates a beautiful, creamy, almost pure white bar. Thank you for sharing this is the first blog i have responded to and find your soap making method very easy to follow will be making my first batch soon and what about adding some color or colors to this soap. 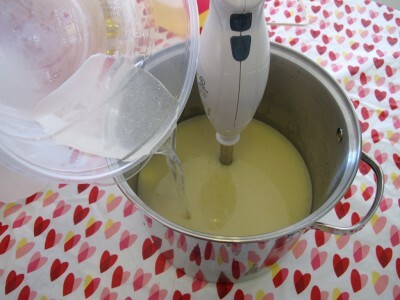 Never heard of the Milk in Oil Method, very interesting!! I will give it a GO! Thank you for sharing :-)! I love the simplicity of this soap! I’ve noticed that most recipes call for fragrance to be typically added at trace but in your technique you added the fragrance before the lye? Could you please teach me why? Thank you in advance. This blog is fantastic! I haven’t made my first batch yet, doing some research before I actually start. Moreover, you have filled in some blank spaces, that the books leave out. I am just wondering what temperature your lye water was and the milk/oil temperature was. The soap looks beautiful and I’m going to have to try this! I don’t usually take temps but like to be around 90 degrees. I would keep them below 100. How many pounds does this recipe make? 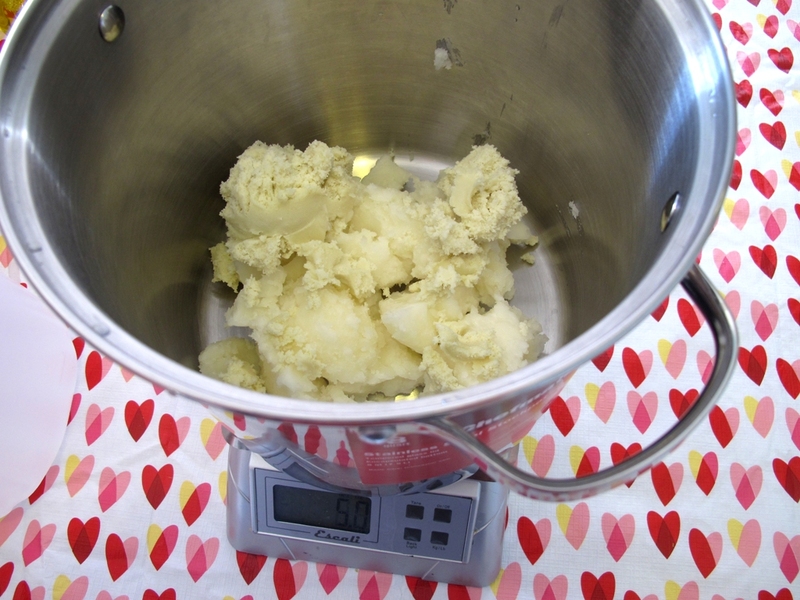 Add up all of the ounces in the recipe and divide by 16. I’m doing it on my phone and in my head and getting just over 5.25 pounds. 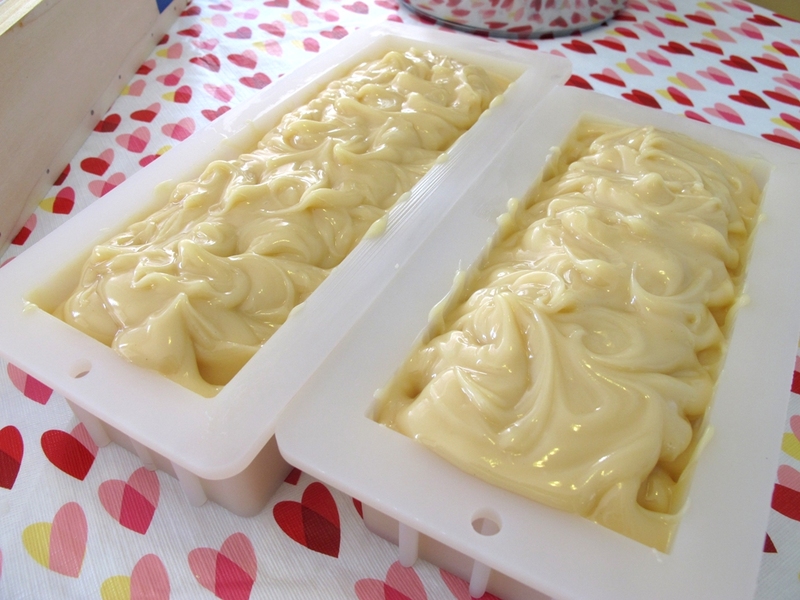 I actually never thought of making my own soap because it’s so much easyer to buy it in the supermarket. But after reading through this I think that it might actually be quite interesting to try this. I love the tops. I usually just let mine get a little thick in the mold and then start manipulating the tops until I like it. It seems so much easier and prettier your way. I will try it next time. Did you cover and let it gel? Or did you prevent it from going through gel phase. Thx Amanda!! I actually didn’t cover it but it gelled. So it heated up a bit in the silicone. I got a partial gel. Hi, I just checked out the Lebermuth site because of your reference, and I didn’t find that particular blend anywhere. Is it a special order blend? Ah, here it is. http://shop.lebermuth.com/manufactured_fragrances-p-rosemary_grapefruit_lime.php Its one of their “natural” fragrances (contains EO’s) not full essential oils. Sorry about that. It is lovely. No unfortunately it has the “other” stuff in it. They had some other brands I’ll look at next time I’m there. It looks very creamy! Is your hemp milk 100% milk, without any other ingredients? The only ones that I can find have extra stuff in them, like cane sugar, guar gum, and usually ascorbic acid as a preservative. I’ve found the same thing in almond and coconut milks, so I haven’t tried to soap with them yet! Very nice. I have not thought to use hemp milk.